With the recent progress in technology in general and internet in particular, we’d like to introduce 3 features your site must have in 2016. Site speed has recently become quite important topic. If your site runs fast, you have a significant advantage. On the other hand if it doesn’t, you can very easily fall behind. We created this article to help you get oriented in recent internet progress and to provide a list of things you can simply turn on to keep the pace. HTTP/2 is a second major version of the world wide web protocol. Instead of opening many TCP connections to request multiple files, HTTP/2 combines multiple requests over one TCP connection. HTTP/2 also rapidly decreases latency by compressing HTTP headers and unlike HTTP/1.1 which is textual, HTTP/2 is binary and therefore smaller in size and easier to transport. All this results in a massive speed improvement by up to 50%. Go ahead and try yourself the difference in the online demonstration here. Even though HTTP/2 doesn’t directly require secure connection, all browsers support it only together with TLS, your site will thus be secured by default. Most browsers added HTTP/2 support only recently. Nowadays HTTP/2 is used by less than 7% according to W3Techs recent report. This means that if you implement HTTP/2 now, you will have a huge competitive advantage. Content Delivery Network is a network of geographically dispersed servers. Your site’s content is copied on those servers and when accessed, the content is available from the closest location, which results in significantly faster loading time everywhere in the world. As the overall traffic is spread, CDN dilutes all requests in multiple servers, which reduces the load on your origin server. As a consequence, your site is more reliable and handles traffic peaks very well. This prevents from server crash when unexpected traffic occurs. Those are just some of the dozens of reasons why you should use content delivery network. In case you’re still not using CDN, do not fall behind. Many sites are already using CDN and many sites are implementing it now. CDN has become a must-have for all sites. HTTPS refers to HTTP over TLS, TLS (formerly SSL) is a cryptographic protocol used to provide privacy and integrity of data communications between the client (browser) and server. To establish the connection, client and server exchange security keys (so called Handshake). This way the connection is encrypted, which prevents from eavesdropping and MiM Attacks. If your site is secured, all the resources (such as pictures, videos, links etc.) on the site must be secured as well in order not to break the secure tunnel. If you linked a non-secure asset, the browser would show a warning. With the recent Let’s Encrypt technology it has become ridiculously easy. Getting an unshared TLS certificate is possible in a fully automated process and for free in just a few seconds. What used to be an annoying, long-lasting and expensive process is now a quick, easy and free with the right partner. Secured website is necessary whether you run a site, an e-commerce or business site. If you’re serious about your site and still don’t have a TLS certificate, it’s urgent to secure your website or you’ll be falling behind more and more every day. Fast loading and secured websites bring better user experience. Your users won’t bounce, stay longer and possibly browse more. Last but definitely not least, speed and security are important factors for your SEO. Especially the latter is considered important for Google’s web rankings. If you haven’t considered any of these, you should do now. 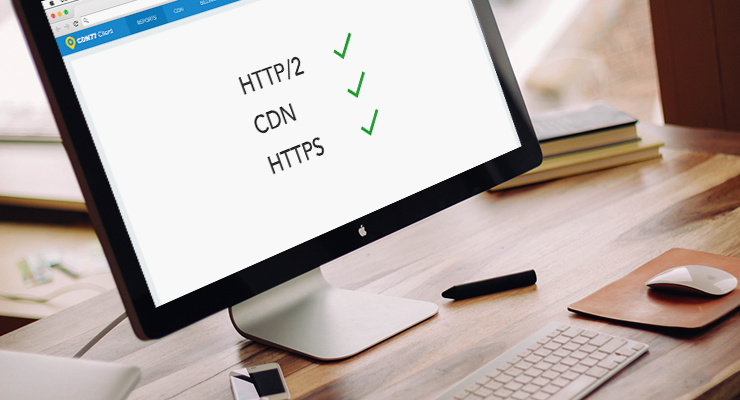 With a right CDN provider, you can have all these in a couple of minutes. We recommend to try this free 14-day trial with no credit card needed with CDN77.com.